Model object. Collections. Delegate pattern, using a picker view. Calculations. String formatting. Fun. 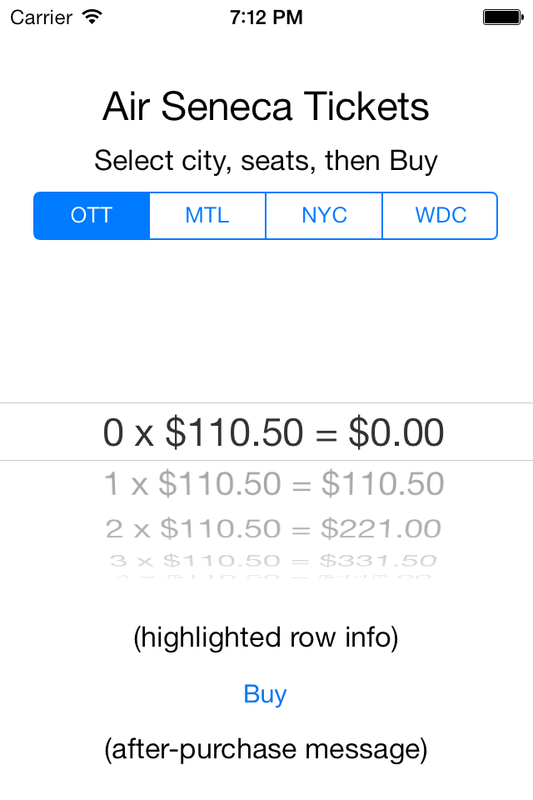 So… you have noticed that there are four elements in the “ticketCost” and “seatsAvailable” arrays. That matches the number of destination cities. You will maintain a logical association between the segmented control’s selected segment index and the index of each array. Important: In the “for” loop that builds the array elements, include the zero (0) seats calculation. That enables you to easily show that a flight has been ‘sold out’ and has no more tickets available. Therefore, be careful to specify your lower and upper range limits correctly. As suggested by the screen capture below, create the user interface. Also, if you used placeholder text in your user interface labels, you could clear them (set them to an empty string). This will run when the user taps the segmented control to change their flight selection (destination). The red value comes from the segmented control. It is the ‘title’ for the selected segment. The blue value comes from the data source for the picker (in the model object). To compose the string, you can use one string interpolation statement, and get the data directly from the sources, or you can create temporary throw-away variables to hold the data, then plug them into a shorter statement. Next, ‘buy’ the tickets. Call the model object’s function to do that. Then, ask the model object method to re-generate the picker view data source.